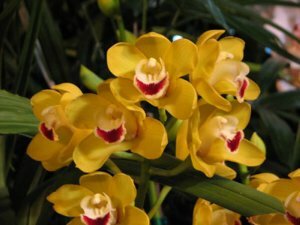 We have covered some of the lessons of orchid care on another page. Here we look at the fall season and orchid care. The fall season for orchids is an important one. It is one where a great number of the orchid plants need care as well as the change in the basic requirements. Here we will cover fall orchid tips for getting your plants ready for the slower growing season. From the summer season to the fall there is less of a requirement for water as the temperature decreases. You will need to monitor this closely. If you see wrinkling on the leaves this means that you need to water more regularly. This is one of the most important of the fall orchid tips. It is important only add fertilizer after you have already watered the plant. Once again be sure that you allow the water and fertilizer to run out of the pot. 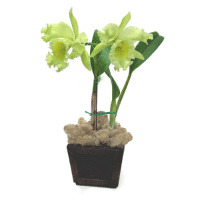 Leaving water and fertilizer in the pot allows root rot to destroy the orchid - very quickly. This is particularly bad for Phalaenopsis orchids. The temperature is also getting cooler in most parts of the country during the fall. So if you have plants outdoors you may start to think about getting them indoors. Most orchids can do well in with temps in the fifties (F.)and few do ok into the forties. I like to suggest that your plants come inside when the night temps are in the mid fifties.If the weather changes abruptly this can be one of the most important of the fall orchid tips. Most orchids (but not all) do not like very cold temperatures. Now let's get to some specific fall orchid tips for some of the different genera. For Cattleyas there growth rate will tend to slow as the fall progresses. The sheaths on the Catts will show some changes indicative of blooming over the next six months. Don't forget the fertilizer and watering. These plants do well in bright lighting. Also, if you are bringing your orchid indoors from being outside check carefully for any pests that may be clinging to the plant. Cymbidiums may start blooming in the fall and they need to be in shaded cool areas. Cyms have a genetically based warmth tolerance but for the best blooms they need an area that is shaded and somewhat cooler. The spikes with the flowers, called inflorescence, needs to be staked to prevent the heavy flowers from weighting down the spike. Phalaenopsis are just starting to go through the next stage to ready for blooms in the late winter and spring. They need a temperature differential in daytime and nightime temps. It is recommended that there be about a 10 - 15 degree Farenheit difference. This is a great fall orchid tips for Phalaenopsis. Often it is the one thing that will encourage a reluctant Phal. to spike! Phalaenopsis also need to be watered and fertilized less often during this first few months of fall. They are resting. It would helpful to give them a fertilizer with a higher phosphorous percentage to help boost the bloosom potential. This fertilizer is also called "blossom booster". Dendrobiums also need a "blossom booster" as well at this time of the year. Remember their flowers are usually plentiful and some grow toward the top of the spike making them top heavy. Use a stake to help hold them erect and be sure that the pot is heavy enough to keep itself upright. If necessary put the pot in aonother heavier pot. Make sure both pots have good drainage. The green leaved Paphiopedilums are also getting ready to have flowers. The shafts are displaying the spikes. Be careful with these orchids as a sudden heat spell will prove disastrous to the new blooms. Keep them in a cooler area and with good air circulation. Paphiopedilums don't like to get dry so be careful with watering. If you were watering twice a week try cutting down to once. But while doing this test your medium with the dry tip of a pencil. Stick it down about an inch or two into the pot, if the tip comes out wet your fine. This should help you to have great orchids both in the fall season and beyond. 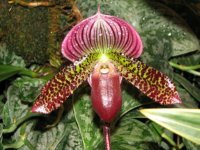 Subscribe to my bi-monthly Orchid Newsletter, Orchidaceae. You will get the up to date news about orchids and how to care for orchids and It is Free! Check out the sign up box to the top left hand side of this page. I promise I will only use your email to send you the newsletter. I will not sell, rent or give your address to anyone.